Trucks come in all shapes and sizes -here are some of my favourite ones. Once you’ve mastered using simple shapes co draw them have a go at sketching them instead. The first one to try is a snowplough / tipper truck. You will need a piece of paper a rubber a black pen and a pencil. First draw three circles to make wheels then join them together with a straight line. Now draw the curvy cab. Put a rectangle behind it at an angle. Add the shovel. Add a rectangular window and draw four squares to look like panels as shown. 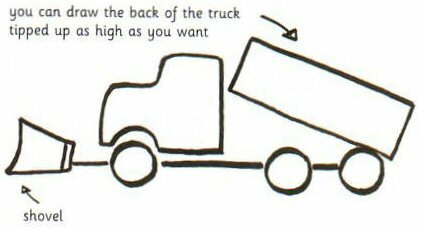 Add some more lines to the back of the truck to show how it’s being tipped up. Now colour it in. 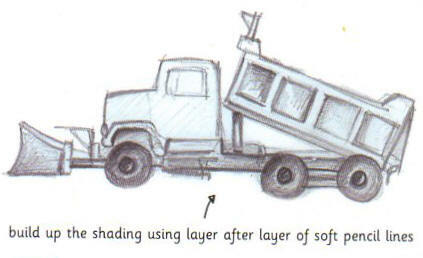 Now make a rough pencil sketch of your truck. Study the picture – can you see how some parts are made darker by using extra shading? Try it!